Please help us find Biggs. 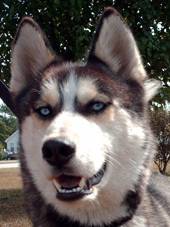 He was adopted in December of 2007 and escaped his back yard on January 13, 2008, in the area of Dulaire and Pinecroft near Four Seasons Mall in Greensboro, North Carolina. He is listed with local shelters and flyers have been posted but sadly there have been no sightings of Biggs at all. We fear he was picked up or taken in by someone without a care that he is missed, loved and very much wanted back. Biggs is microchipped and has both an ID tag and rabies tag on his collar. Makes no sense that someone would find him and not contact us. We are very hopeful that Biggs is okay and that his microchip will get him back to us. Please keep an eye out for him and contact us if you think you know where he is or who may have him. Biggs is a black and white male Siberian with blue eyes. His approximate DOB is May 2006 and he weighs about 46 lbs. He is tall, leggy and very friendly. Biggs is a goof ball. He's just happy to be around and having fun. He loves to romp and play with his foster siblings, is great with humans but not tested with cats. Biggs is a black and white male Siberian with blue eyes. His approximate DOB is May 2006 and he weighs about 46 lbs. He is tall and leggy...better to run and jump in the back yard. Biggs is new to our program but so far we know he crates well, does pretty well on leash but does dig some in the back yard. He has marked in his foster home upon arrival but not done so recently. He has not shown much interest in chew toys but will occasionally grab a Nylabone. He has not challenged the fence at his Foster Home, but that fence is hotwired. He is working on sit and other basic commands. He loves to cuddle and snuggle. Please check back on Biggs as he settled into his foster home and we learn a bit more about him. All Southern Siberian Rescue foster dogs are microchipped, up to date on shots, spay/neutered and on monthly heartworm preventative. 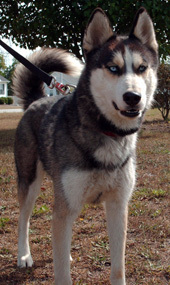 For additional information on Southern Siberian Rescue and Siberian Huskies, please visit www.SouthernSiberian.com. To fill out an application, please visit How to Adopt.